1) Origin of the Vedas. At the time of creation the Veda was born from the face of Brahma. It contained a lakh of granthas with four padas like Rk. From the Veda were born the ten yajnas. The Veda was originally one. It was Vyasa who divided it into four divisions resulting in the four Vedas. When Brahma commanded Vyasa to divide the Vedas into divisions he first selected four disciples who could see the end of the Vedas. Besides these he selected the highly intelligent Romaharsana Suta to study the Itihasas and Puranas. At first, the Veda was one. Vyasa divided it into four. He based the division on the caturhotra, performance of four hotris. that of Brahma as Atharvans. He devoted Atharvaveda to specify the rites and duties of Kings and the deeds of Brahma. Vedavyasa thus split the single Veda tree into four and from there arose later a forest of Veda trees. 2) The Gurus of Rigveda. Paila divided Rgveda into two samhitas and gave one each to Indrapramati and Baskala. Sage Baskala divided his Samhita again into four and taught it to four of his disciples, Bodhi, Adimadhava, Yajnavalkya and Parasara. Indrapramati without splitting his samhita taught it to his renowned son, Mandukeya. The branch of Indrapramati thus went down into circulation through the disciples of Mandukeya and the disciples of the disciples and so on. Vedamitra of Sakalya gotra, one sage in the line of the disciples of Mandukeya, split the samhita into five, and taught it to Mudgala, Gomukha, Vatsya, Saliya and Sarira. Sakapurna a godbrother of Vedamitra divided it into three and added a division to it by composing a Nirukta of his own. He taught them to Vaitalika, Balaka and Kraunca. This was how the Indrapramati Samhita produced branches and sub-branches. Baskala divided his samhita into another set of three and taught it to Kalayani, Gargya, and Kathajava. The sages mentioned above are the ones who spread Rgveda in the world. Vaisampayana, disciple of Veda Vyasa, made twentyseven divisions of Yajurveda and taught them to his disciples. Among those disciples was Yajnavalkya, son of Brahmarata. The branch Taittiriya originated from Yajnavalkya. Once all the sages learned in the Vedas made a decision. He who does not attend the Brahmasamaja meeting held at the mountain of Mahameru will be tainted with the sin of Brahmahatya (murder of a brahmin). At onetime Vaisampayana was not able to attend and so was charged with the sin of Brahmahatya. He called his disciples to his side and told them that they should observe a Vrata to absolve Vaisampayana of his sin. Then one of his disciples, Yajnavalkya, stood up and said that he would observe the vrata alone and that there was no need of anybody else in that matter. When asked why he said so he replied that none of the colleagues of his was so brilliant and majestic as he was. Vaisampayana did not like this arrogance of Yajnavalkya and so angrily commanded Yajnavalkya to give back all that had been taught to him by Vaisampayana. Obeying orders Yajnavalkya vomited all the yajus and went away from the place. The other sages taking the form of the bird, Tittiri, accepted the vomited yajus. Therefore that branch of the Veda got the name of Taittiriya and those sages were known as the Taittiriyas. On his leaving Vaisampayana Yajnavalkya put into operation a new set of Yajus called Ayatayama unknown even to Vaisampayana. This was how it happened. Yajnavalkya after leaving the Brahmasamaja went and did penance to propitiate the Sun-god. The Sun appeared before him in the form of a horse. Yajnavalkya then requested him to grant him new yajus unknown even to Vaisampayana. The Sun then remaining in the shape of the horse (Vaji) itself imparted to him instructions on a new set of Yajus called Ayatayama which were not known to anybody else, even to Vaisampayana. Those who studied it were called Vajis. There are fifteen branches of the Vajis, Kannu being one of them. All were put into operation by Yajnavalkya. 6) The sages of Samaveda. Vedavyasa taught Samaveda to Jaimini. Jaimini had a son, Sumantu, and he in turn had a son named Sutva. 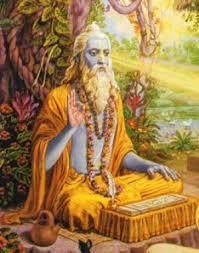 Sumantu and Sutva were very intelligent and they studied one branch each of the Vedas. Sutva had a son, Sukarma, and he divided Samaveda Samhita into a thousand branches. Sukarma had two disciples: Hiranyanabha and Pauspinji, and both of them studied all the thousand divisions of the Samaveda. The five hundred disciples of Hiranyanabha who came from the north and studied Samaveda were called Udicya Samagas (those come from the north). Pauspinji had four disciples: Logaksi, Kauthumi, Kaksivan and Langali. These four and their disciples split their samhitas and increased them. Krti, one of the disciples of Hiranyanabha, taught his disciples twentyfour samhitas. They also split them into many more and made the Samaveda bigger. 7) The sages of Atharvaveda. Vyasa taught Atharvaveda to Sumantu. Sage Sumantu taught it to his disciple Kabandha first. Kabandha split it into two and gave. one each to his disciples: Devadarsa and Pathya. Devadarsa had four disciples: Medha Brahmabali, Santakayani and Pippalada. Pathya had three: Jabali, Kumuda and Saunaka. All these made samhitas. Saunaka split his samhita into two and taught one to Badru and another to Saindhava. Munjikesa learnt it from Saindhava. He split it into two first and then again into three. The five samhitas of Munjikesa namely, Naksatrakalpa, Vedakalpa, Samhitakalpa, Angirasakalpa and Santikalpa are the most important divisions of the Atharvaveda. The Naksatrakalpa contains methods of worshipping Naksatras; the Vedakalpa contains the rites of the Rtvik Brahma, and the Samhitakalpa contains the science of the care of horses and elephants. Vyasa compiled a Purana samhita using speeches, appendices, poems and Kalpanirnayas and taught it to Romaharsana Suta. Suta had six disciples named Sumati, Agnivarcas, Mitrayus, Sarirsapayana, Akrtavrana, and Savarni. Akrtavrana, Savarni and Samsapayana born of Kasyapagotra have themselves made Purana Samhitas. There is another samhita composed by Romaharsana based on the samhitas made by the above three. Visnu Purana is based on the latter four samhitas. There are eighteen Puranas, namely, Agni, Brahma, Brahmanda, Brahmavaivarta, Bhagavata, Bhavisya, Garuda, Kurma, Linga, Markandeya, Matsya, Naradiya, Padma, Siva, Skanda, Vamana, Varaha and Visnu.